The many newsletters put out by small environmental grassroots groups reveal a West that is complex, quirky and deeply committed. John Jolley's "Grassroots Advocate," published in Casper, Wyo., serves as a determined gadfly to the state and the federal government. 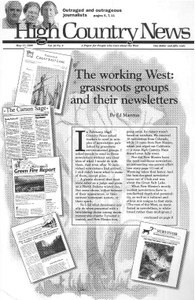 A directory gives brief information on some of the many newsletters from grassroots groups in the West. A journalist takes columnist Alexander Cockburn of the Nation severely to task for his recent writings, especially about wolf reintroduction. A draft report from the National Academy of Sciences confirms that 30-40 percent of Yellowstone bison test positive for brucellosis but concludes that the risk of them infecting cattle is almost nonexistent. The Western Ancient Forest Campaign sets up a new office in Nevada City, Calif. The federal program, "Jobs in the Woods," intended to retrain timber workers in the Northwest, may have helped some workers, but the Klamath Forest Alliance says the program allows politics rather than science to decide what projects are undertaken. The Wyoming Outdoor Council's new report, "Nuclear Jeopardy," says a proposed private nuclear waste dump in central Wyoming is a bad idea. The Montana Wilderness Association will lead hikes on public lands during its 36th annual Wilderness Walks program from May to September. Grassroots activists will gather at the Southwest Citizen Mining Activist Conference May 29-31 in Durango, Colo.
A conference to unite activists with scientists and radiation health professionals will meet June 5-7 in Roswell, N.M.
Island Institute's 15th annual symposium on human values and the written word will be held June 18-24 on Alaska's Baranof Island. A celebration of shepherds and weavers, Sheep is Life, will be held June 25-28 at San Juan College in Farmington, N.M. The National Wildlife Federation wants to recognize young people, educators and others who contribute significantly to protecting the natural world. The University of California at Santa Cruz will host "Green and Gold," July 31-Aug. 2, a conference to commemorate the 150th anniversary of the 1848 discovery of gold and signing of the Guadalupe Hidalgo treaty. Orion: The Hunter's Institute and Montana State University will host a conference July 25-Aug. 1 in Bozeman, Mont. Smart Growth Regional Partnerships gives grants of up to $75,000 to towns and counties in Colorado to help address growth-related issues. More than 80 conservation groups will be represented at the 1998 National Wilderness Conference, May 29-31, in Seattle, Wash. The Forest Service agrees to begin removing cattle from 230 miles of streams in New Mexico and Arizona. The General Accounting Office reports that the Dept. of Energy has not found out enough about the soil between the water table and the Hanford Nuclear Reservation's leaking tanks to make environmentally sound cleanup decisions. Montana is prepared to fight a new federal proposal that would allow "low-risk" bison unlikely to spread brucellosis to leave Yellowstone National Park without being killed. Mexican gray wolves released on AZ-NM border; Sen. Larry Craig adds logging rider to bill; Gov. Leavitt says foes of new monument must pay for fight; Nev. bomb tests pricey; Idaho's Owyhee Canyon not yet open; Danns in Nevada still graze without permit. Some environmentalists say a bill making it easier for outfitters to get permits on federal lands would give commercial interests too much power over public lands. In an election that drew a lot more media attention than actual voting, the Sierra Club membership votes down a controversial anti-immigration policy. The Montana Dept. of Environmental Quality is in turmoil as employees complain and quit the agency, citing "lousy management" and manipulation that favors industry. Rick Swart, editor of the Wallowa County Chieftain in Oregon, is at the center of a storm over his outspoken opinion that the high school should change its 71-year-old team mascot, the Savages, because the name is offensive to Native Americans.